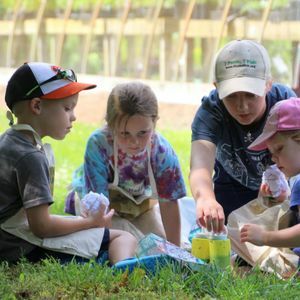 CAMP PAW PAW: "Wild Child"
July 8–12, 2019 9:30 a.m.–12:30 p.m. If the outdoors is your favorite place to be, then this camp is for you! We'll spend a wild and wonderful week exploring the diversity of plants and animals that call the Arboretum home. Climbing trees, building fort, wading in streams, and gathering blackberries are part of the fun. Along the way, we'll craft cool nature stuff to use in your own backyard, including a paper plate sundial and a water scope. Healthy snacks, games, and team-building will round out the week. **Upon registration, you will receive a confirmation email containing a welcome letter, a list of items to bring to camp, and health forms. Please be sure to print the forms and bring them on the first day of camp, or click on the link in your email confirmation to complete the forms online. Call 410-634-2847, ext. 23 or ext. 0 with questions. A camp T-shirt is included in the fee!